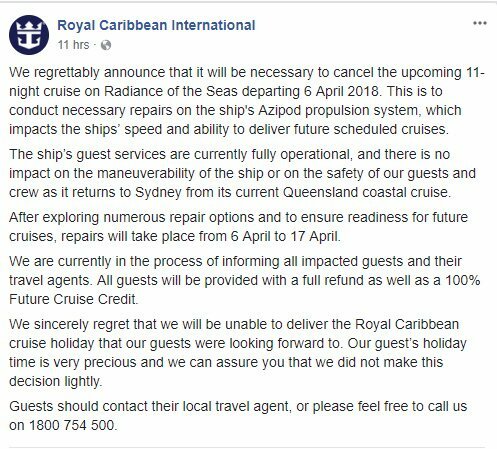 Royal Caribbean informed guests booked on an upcoming Radiance of the Seas sailing their sailing has been cancelled as a result of needed repairs. The cruise line announced the upcoming 11-night cruise on Radiance of the Seas departing April 6, 2018 will be cancelled in order to conduct necessary repairs on the ship's Azipod propulsion system, which impacts the ships’ speed and ability to deliver future scheduled cruises. Repairs to Radiance of the Seas will take place from April 6 to April 17.